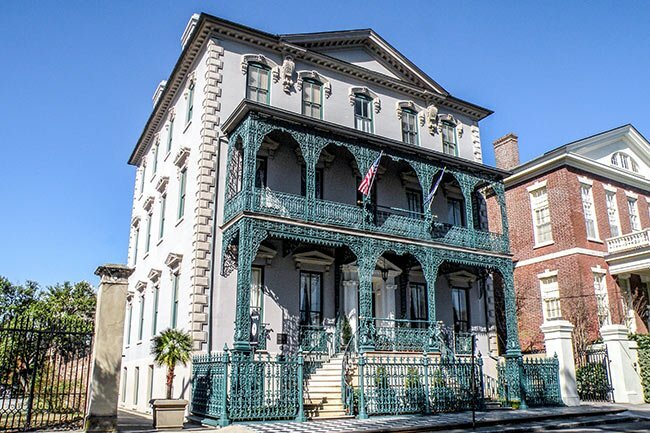 The John Rutledge House on Charleston’s Broad Street offers visitors to the Holy City a chance to experience a piece of South Carolina history. Now an inn, this home was built in 1763 by John Rutledge for his 19-year-old bride, Elizabeth Grimke. Rutledge served many roles in government, including president of South Carolina from 1776 until 1778. When the South Carolina state constitution changed its executive title from president to governor, Rutledge became South Carolina’s first governor, serving from 1779 through 1782. He also served at the United States Constitutional Convention, as an Associate Justice on the United States Supreme Court, and as Chief Justice of the South Carolina Supreme Court. Rutledge sold the home before his death in 1800, and it changed hands among prominent South Carolinians several times. In 1853 slave trader Thomas Gadsden purchased the house and added a third floor. Gadsden was responsible for the terra cotta window cornices as well as the cast and wrought iron work on the balcony, stair rail, and fence. The ironwork is attributed to German ironworker Christopher Werner, who also designed the Sword Gates as seen at 38 Legare Street and The Citadel. The ironwork at the John Rutledge House depicts both palmetto trees and eagles, common motifs in Werner’s pieces and said to be representative of the statesman Rutledge. The house suffered damage during the Civil War, as evidenced by the cannonball strike on the third floor in the above photo. Yet the home survived and continued to be one of downtown’s most storied structures. 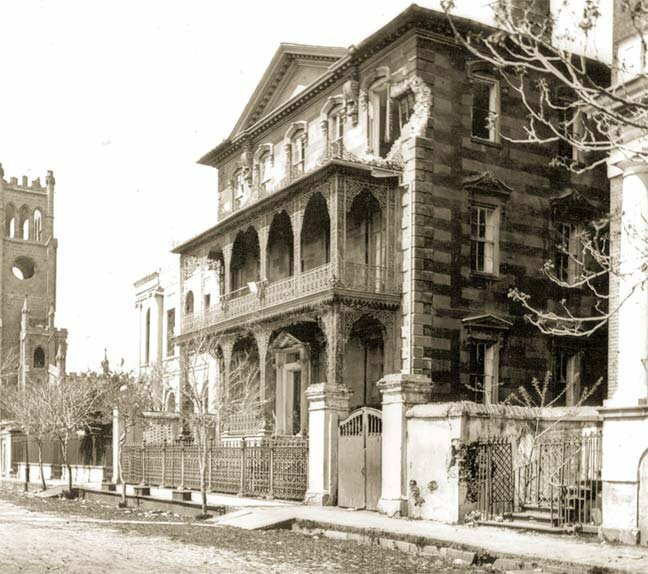 Gadsden sold the property in 1885, and in 1902 the home ended up in the hands of Robert Goodwyn Rhett, mayor of Charleston and president of the People’s Bank at 18 Broad Street. Legend has it that upon one of President William Howard Taft’s visits to Mayor Rhett, butler William Deas created she-crab soup to serve to the president. The house has served many functions other than a residence. In 1948 it became home to Gaud School for Boys, a school that would merge with Porter Military School and Watt School in 1964 to form what is now Porter-Gaud School near the Ashley River. Following the school’s move, the house was leased as office space and apartments before sitting empty until the 1980s. 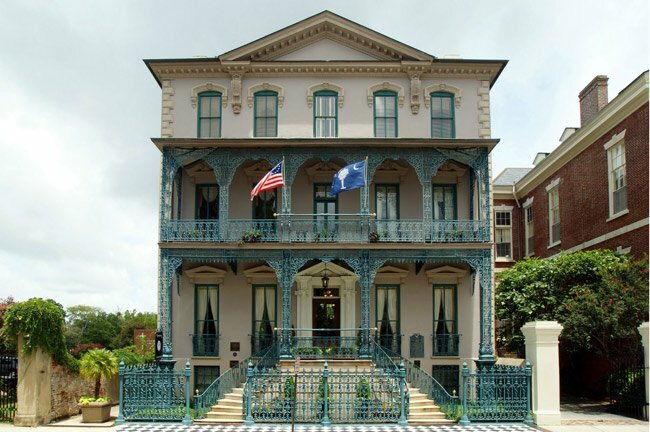 In 1988 Richard Widman restored the John Rutledge House and opened it as the John Rutledge House Inn in 1989. It has remained a popular venue for visitors who want to immerse themselves in authentic historic Charleston. John Rutledge, a signer of the Constitution and wartime Governor of South Carolina, 1779-1782, lived at 116 Broad Street from 1763 to 1800. Rutledge was one of the foremost lawyers in South Carolina. He opposed the Stamp Act and in the Stamp Act Congress of 1765 he was chairman of the committed which wrote the memorial and petition to the House of Lords. He was a member of the First and Second Continental Congresses and helped write the South Carolina Constitution of 1776. Rutledge served as Governor from 1779 until 1782. In 1784 he began his judicial career with election to the chancery court of the state and from 1784-1790 also sat in the state House of Representatives. In 1789 Washington appointed Rutledge Senior Associate Justice of the U.S. Supreme Court and he held this office until February 1791, when he resigned to become Chief Justice of South Carolina. Rutledge died in Charleston on July 23, 1800. The house is a large three-story over elevated basement brick house with a slate covered roof, a pair of large brick chimneys set in either side wall, and an elaborate two-story cast and wrought iron porch on the front elevation. The first two stories were built by Rutledge in 1763 and the third floor was added by Thomas M. Gadsden in 1853.